Albertville Shops, Whats there and Why go? Albertville hosted the 1992 winter Olympics which it spread the events over many of the local ski resorts like Val d’isere, Tignes and Les Menuires. 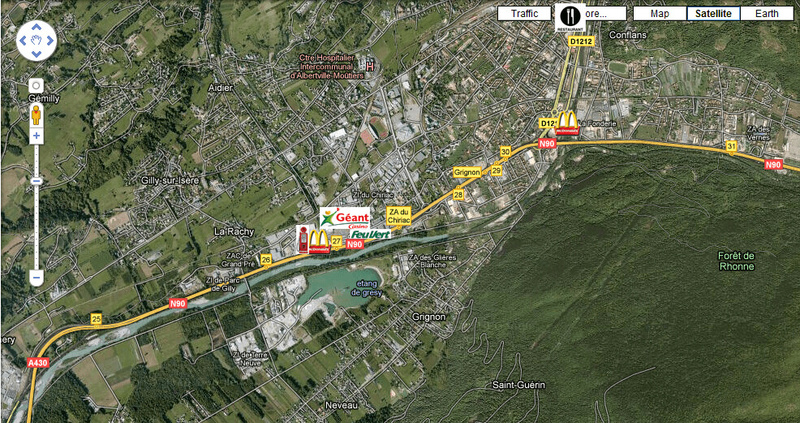 Albertville itself is a small town approx 15mins from Moutiers at the base of the mountains. There are many shops in the town which includes a ‘old town’ area. We have listed the most common shops that skiers would like to know about in this town and have also put them on our map. Geant is the biggest supermarket in the town and is owned by Casino, both of the logos are on the front of the shop. It has a big car park which it shares with McDonalds and Inter-Sport to name a couple. This supermarket has almost everything you would want and is the first place to visit in the town for your shopping. Feu-Vert is a shop similar to the UK’s Halfords. It has the normal car equipment but most importantly it sells Snow Chains and Anti-Freeze. If you need any of these, this shop is the cheapest in Albertville. It also sells snow-tyres but only has the most popular sizes in stock. Petrol Station that is located just outside Geant is generally the cheapest in the town, we have put a fuel logo on our map to show you where it is. Fast Food is everywhere and Albertville isn’t any different. It has a couple of McDonalds, Quick Burger as well as local pizza and burger shops. Restaurants are a plenty here, SkiGB recommends the Chinese restaurant which is just outside of the old town, we have put a knife+fork on the map where it is, enjoy! Don't miss out on the latest Ski News and Ski Holiday Offers, sign up to THE Ski Newsletter!